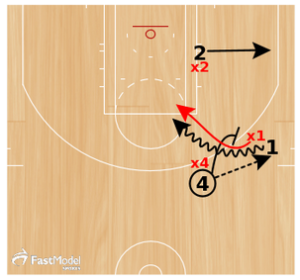 This drill is from Drew Hanlen of Pure Sweat Basketball. It requires players to defend a variety of screening actions in a short amount of time. The drill is also posted in Fast Model Sports Basketball Drills and Plays Library. Drew is an NBA Strategic Skills Coach & Consultant that has helped over 25 NBA and NBA pre-draft players. Drew is the Head Skills Coach for Pure Sweat Basketball. He has run his internationally renowned Elite Skills Clinics in over 30 states and 4 countries over the past four years. You can also use this as a multiple purpose drill by having one coach working with the offensive players on setting and using screens. If there are other screens, that you need to be able to defend from the teams that you play, you can always modify and adapt the drill to fit the needs of your team. Ball handler (Player 1) will start with the ball at the top of the key and will be pressured by an on-ball defender (x1), while an offensive (Player 4) and defensive (x4) post player will start on the wing and an offensive (Player 2) and defensive (x2) guard will start on the strong-side block. Offensive post player on the wing (Player 4) will set a pindown for the offensive guard (Player 2), who will use the pindown and pop to the wing and receive a pass from the ball handler (Player 1). Offensive post player (Player 4) will then set a UCLA screen for the offensive player at the top of the key (Player 1). 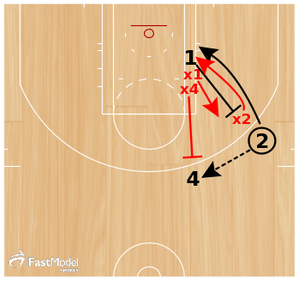 Defender guarding the player using the UCLA screen (x1) will jump to the ball then get through the UCLA screen, while the screener’s defender (x4) will provide help if necessary. After setting the UCLA screen, the screener (Player 4) will pop to the three-point line and receive a pass from the ball handler (Player 2). 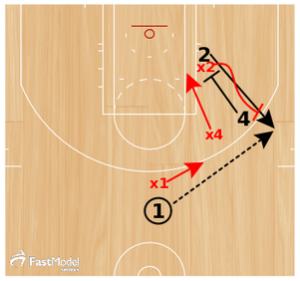 Offensive player on the block (Player 1) will immediately set a back screen for the offensive player on the wing that just made the pass (Player 2). 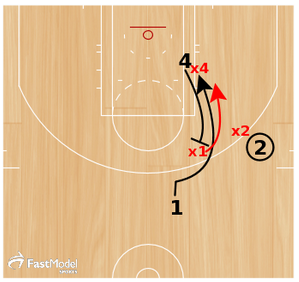 Defender guarding the player using the UCLA screen (x2) will jump to the ball then get through the back screen, while the screener’s defender (x1) will provide help if necessary. After setting the back screen, the screener (Player 1) will pop to the wing and receive a pass from the offensive post player (Player 4), who will then follow their pass and set an on-ball screen. Drill becomes live 3v3. Defenders should guard the ball screen using their team’s defensive principles.